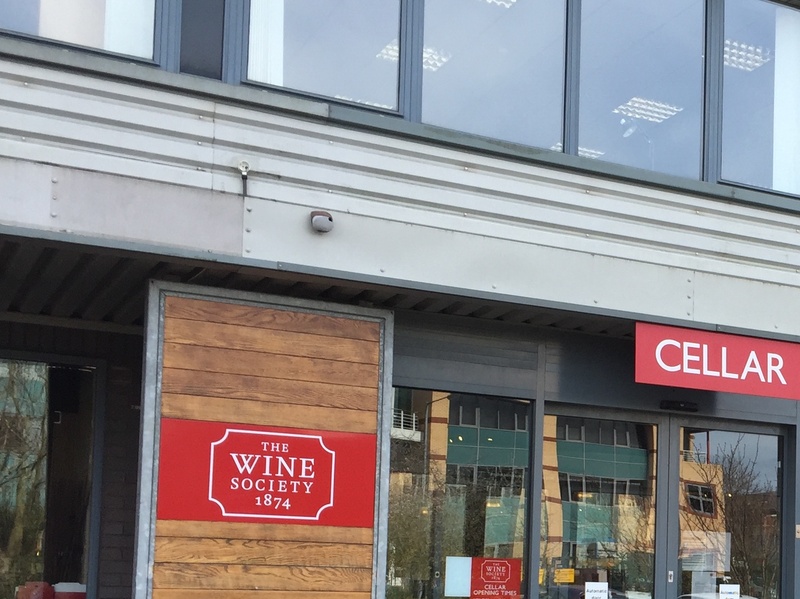 Following the two Italian reds last week we tried another duo on Friday, this time from the New World – an Argentinian Malbec and a ‘Bordeaux Blend’ from Stellenbosch in South Africa. Miles Mossop is a noted wine maker in South Africa; this wine was his Max 2008. He brings in grapes to the Tokara winery and vinifies them under his own label – an arrangement he has with the owners of the winery. His grapes can be drawn from good sites in the Western Cape but the wine we tried was from grapes solely from the Stellenbosch region. Cabernet Sauvignon made up half of the blend, the other two grapes were Petit Verdot (27%) and Merlot (23%). Richard’s comment “everything you hope for in a claret” pretty well summed the wine up. Ruby red with some ageing evident, this had slight menthol notes but the dominant aromas were of non-specific dark fruits, but a well-balanced blend of plums, blackcurrant and blackberry. The ageing had introduced a cooked, concentrated quality which was really attractive. There was also a “hint of volatility” (Richard) which was beguiling. The tannins were just right, providing enough drying ‘grip’ to prevent the jamminess. This had big, rich flavours and a good mouthfeel; I detected slight heat at the finish (14% ABV). This was a quality wine which was drinking well just now; ideal for the steak which was to accompany it. From Max to Malbec. We don’t try Malbec on this blog and those we have tried – all comparatively upmarket – have not impressed. I tasted this one (Vinalba Gran Reservado 2014) blind and was unable to recognise the grape. A very different appearance to the Max with the colour a glass-stain purple. A green nose with some fruit, leading into a supple, rich, smooth taste and good mouthfeel, albeit one with no real defining characteristics. I’m not sure what ‘Gran Reservado’ means in an Argentinian context – the Vinalba website has no information. [Geoff: I believe (but can’t confirm) that Gran Reservado entails a minimum of two years ageing but agree that the terms ‘reserve’ and ‘grand reserve’ seem to be used with no actual legal definition of ageing, yield, alcohol levels etc. There are 200 kilometres separating the two northern Italian reds we tasted on Sunday; one wine from Piedmont and the other from the Valtelline, an Alpine valley. They showed quite differently despite both being dominated by the Nebbiolo grape and having undergone a fair amount of ageing in wood and bottle. The Toraccia del Piantavigna 2007 is a DOCG Ghemme from Piedmont and is made from two grapes, Nebbiolo and Vespolina (10%). It’s ABV is 14%. It has to be aged for a minimum of 34 months. 18 months min. in barrel and 6 months min. in bottle which makes me wonder where the other 10 months could be spent. No matter, but if anyone can venture a suggestion …. It had the typical Nebbiolo colours of brick rim and red core. The nose was a powerful smoky and farmyard mixture (slightly oxidised?) that was certainly attractive and sweetened by a mature cherry fruit smell. The palate was definitely dry, tannic and again reminiscent of sour cherries. It is difficult to pin down these flavours and smells but I thought it like unripe black fruits, picked just before they’re ready – an amalgam of the sweet and sour. Unlike the older Valtellina, this had some power left and will get finer; Nebbiolo is always worth waiting for. Bags of character and certainly a food wine – game meat would be ideal. The older wine was a Valtellina Valgella Balgera 2001 which Geoff picked up in Loki Wines. This was another Nebbiolo, called Chiavennasca in this region. The Valgella subdivision is reputed to produce the most delicate wines in the area but I drink very little Nebbiolo and couldn’t confidently identify it. Nonetheless, a brick red appearance with obvious age on the rim, a clean fruity/floral nose leading to a long, savoury flavoursome dry finish which was slightly less impressive than the nose led you to expect. Quite lean in the mouth in the style of a Rioja and definitely a food wine. Comments Off on It’s a Ghemme. We shared a red and white blind tasting on Friday, Richard supplying the white while I delivered the red. Both wines, it transpired, were purchased from that wonderful wine company Tanners of Shrewsbury, where good knowledge of the wines they sell is really evident and greatly appreciated. Richard had decanted the white wine which, when in the glass, assumed a light yellow colour, beautifully clear and bright (some wines do stand out in this respect) with some viscosity, but not much. The nose wasn’t particularly strong but its lemony freshness dominated quite a complexity of aromas. There was a slight caramel hint to the bouquet. In the mouth, there was still plenty of acidity which balanced the quite ‘oily’ weight of the wine. The flavours were certainly tropical – pineapple, peach, apricot – but the distinctive notes were that of white stone fruits. This was a lovely sipping wine – and at 14.5% ABV deserved to be treated with some respect. It would last for ages in the glass and keep changing; Richard will confirm the taste later in the evening. The wine was Rostaing’s La Bonnette Condrieu 2010, from a vineyard directly north of Condrieu village itself. The books state how this area – and its Viognier grape – has gained popularity since its near extinction in the 1960s, when only 30 acres were being planted, to the 405 acres of 2011. The wine is meant to be drunk young as, I suppose, its freshness is a beguiling part of the experience. A lovely wine. 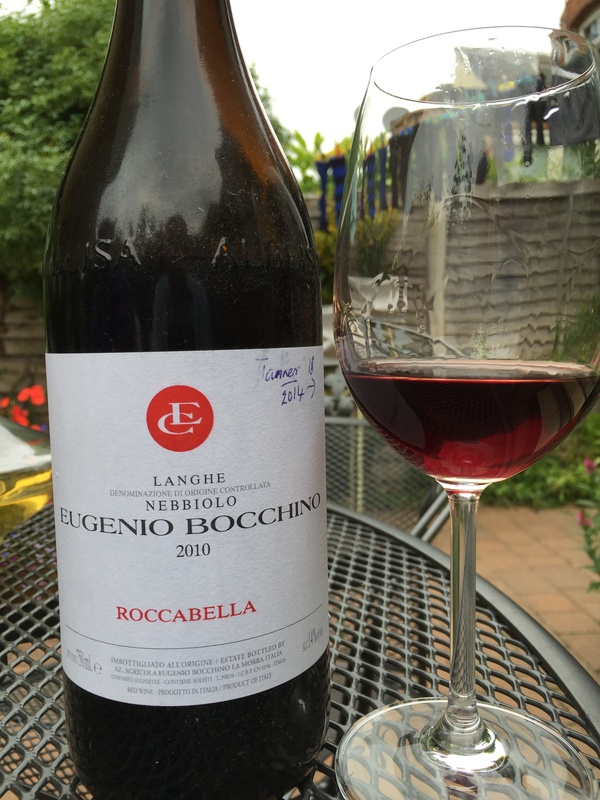 Richard: I took notes on the red, a Langhe Nebbiolo by Bocchino. Tasting it blind I found the nose recognisable but couldn’t place it. Annoying since I’d drunk this wine before, also bought from Tanners at the same time as Geoff. And we’d tasted a few Barolos at a recent WS Italian tasting in Brum (Tanners describe our wine as a ‘Barolo lookalike’). Brown rim, rich warm savoury on both nose and palate, full with a slight hint of alcohol. Some tannin giving structure. Excellent wine from an underrated region, which I’d buy again. Our wine pilgrimages? First Jerez, in sunny southern Spain. Then the Alsace slopes of the Vosges mountains. And now? Stevenage under lowering Hertfordshire skies. Just off junction 7, to be exact. What bathos, I hear you say (Or was it “What’s bathos?” In that case, look it up.) Ah Stevenage. A designated new town in 1946 and the country’s first traffic free shopping area. Birthplace of such luminaries as Jack Wilshere, Ashley Young and Lewis Hamilton. Or, for the more literary, environs of ‘Rook’s Nest’, the house described in E. M. Forster’s ‘Howard’s End. But you knew that, anyway. It’s the home of …. The Wine Society. Fronting a busy dual carriage way and proclaiming, in the burgundy colours of the WS, it’s amazing that Richard and I missed it on the first drive up the road. But we did. Just to prolong the anticipation. And we were there. Removing shoes and headgear, lowering our eyes, (there was a slight genuflection from R. or was it a wince, thinking about his ‘investments’? ), we shuffled forward and were received, welcomed even, by a lay member who explained the floor-plan. I bit my lip and resisted the question “Do you stock Echo Falls?” So, we were let loose to wander and wonder. Stocks reflect what’s in the printed list (not the on-line list) and there’s plenty of those lists around. Divided into countries, it also featured the WS’ own label, a bin-end section and a Vintage Room. There was also a free enomatic sampling machine and one where you could buy a card (more expensive wines from about 70p a taste). Most of the gazers were male and middle-aged; their wives looking bemused and long-suffering of their husbands’ obsession. They’ll probably ask the question on every wife’s lips “Do you need any more wine?”. Any children there looked bored as they glanced up from the Play Station. One man conducted a business lecture, glass in hand, on his mobile while we danced around him. He was obviously ‘working from home’ that day. Good points? Very obliging and knowledgeable staff (thank you Conrad) was my abiding memory. Suggestion? It might have been better to put all the bin ends on shelves rather than leave them in rows of boxes. Oh, and if you want to visit, check the printed list and if your wines are not on that, pre-order and collect. So, two wines in this review, both opened on Friday evening and gently enjoyed with some very original food – which Richard, being the chef, will describe. 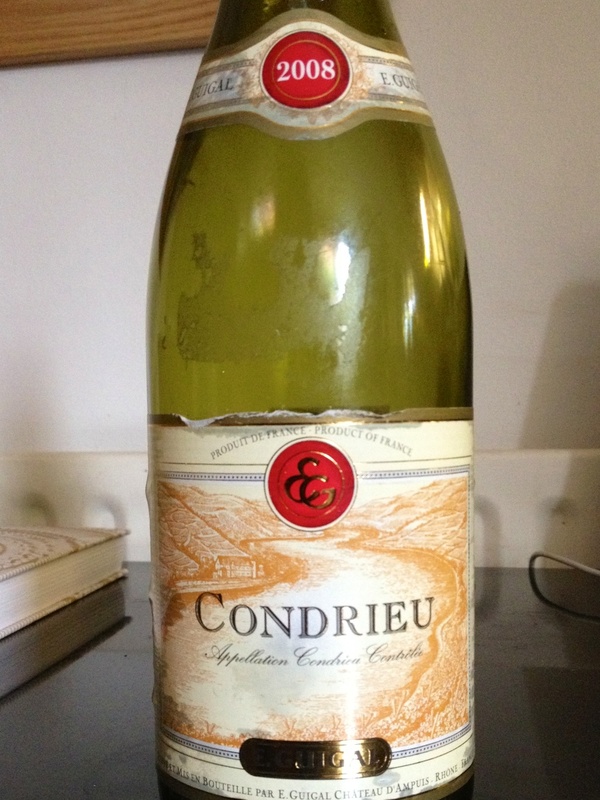 Firstly, a Guigal Condrieu 2008, spotted in a Waitrose sale so not as expensive as they usually are. It was quite a distinctive pale-green, very bright with some viscosity. On the nose, there was the pronounced peach and apricot fruit aromas, quite floral and delicate rather than earthy. Typical Viognier style, you might say. The palate was a little disappointing, albeit with a heavy mouth feel, rather short, dryish but lacking in any vigour. However we both agreed it might have been better decanted or even left opened to get somewhere closer to warm room temperature. This is not a white that can be treated like the others and whipped out of a cool spot and drunk immediately. However, this wine almost needed the cool to give it some ‘backbone’ – it seemed a little soft – attenuated, Richard suggested. We decided to decant the next one. 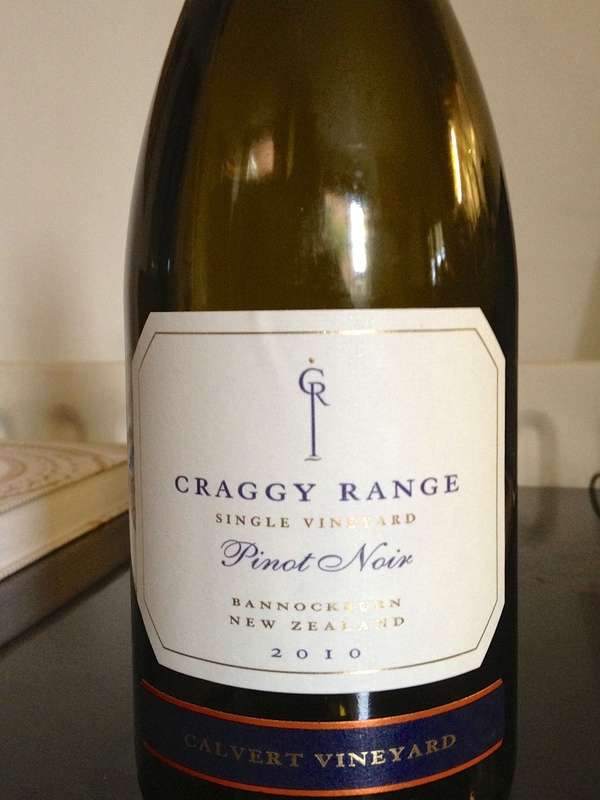 The 2010 Craggy Range Pinot Noir circa £30 from Majestic was er … majestic. It was a clear, but deep, red with plenty of viscosity. There was no hint of purple, suggesting maturity. Initially, it was shy on the nose – the aromas there were vegetal although the longer it was opened the sweeter the nose. The palate was silky smooth, dry and delicate yet with some body giving it structure. 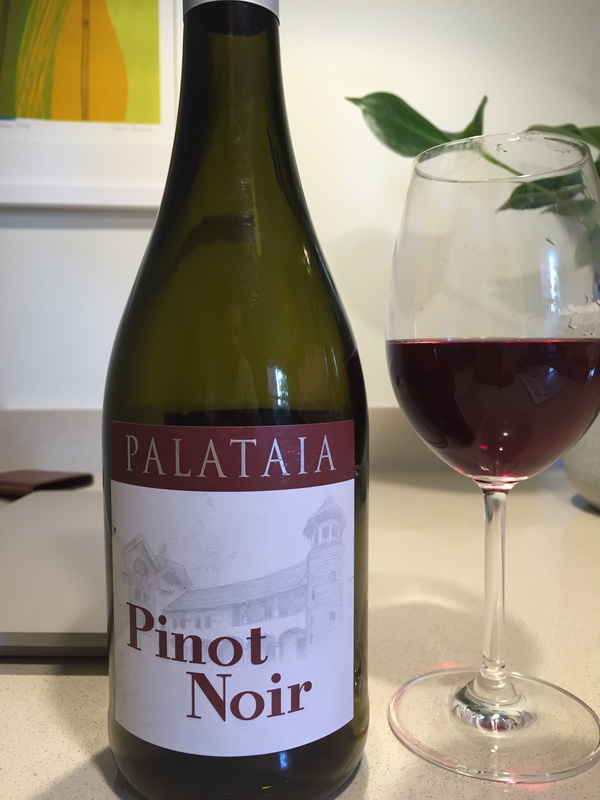 A well-made wine which was easy to drink, it initially had some minerality on the finish but this vanished as it developed and we were left with the wonderful sweet flavours that only a good Pinot shows. This delicious wine – there are five more, thankfully – was a revelation with the food, coming up next. [Richard, great wine and one where you are really hoping there is another glass left, even though you know there isn’t. The food. Two recipes from Jerusalem, the new book from Yotam Ottolenghi. First cod cakes in tomato sauce. Lots of spices, like cumin, paprika and coriander in the cakes and the sauce. Mint added at the end gave the sauce a lift. If I did it again I would’t food process everything, only the breadcrumbs, then finely chop the cod and mix by hand. 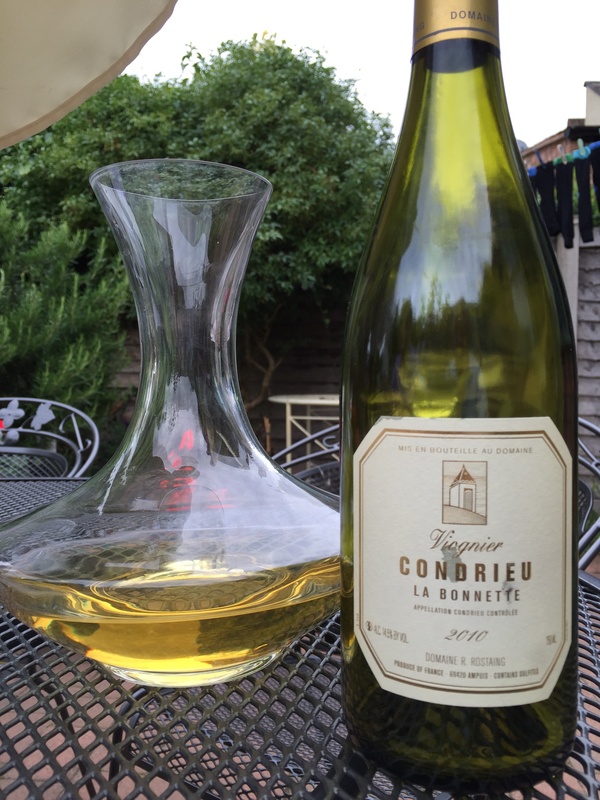 A decent match with the Condrieu. Next was saffron chicken and herb salad. I like using saffron so was keen to try this. The base is a sauce made from long simmered orange segments, honey, wine vinegar and saffron. This was used to dress a salad of grilled chicken, sliced fennel, red chilli and lots of herbs. The pinot, being slightly sweet. was a good match.